Gorgeous yellow, pink, red, orange, white and purple blooms put on a show in early spring from plants like forsythia, lilac, azaleas, rhododendron, mockorange, weigela and bridal wreath spirea. Summer then greets us with bold blossoms in hues of purple, magenta, blue and red from butterfly bush, hydrangea, crape myrtle and rose-of-sharon. These deciduous shrubs provide a beautiful backdrop for the garden and most of these plants only require basic watering, fertilizing and pruning. Why not add them to your yard today? 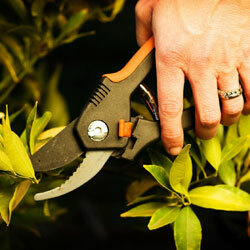 To keep your shrubs healthy and blooming prolifically, it is important to know which plants to prune at what times. 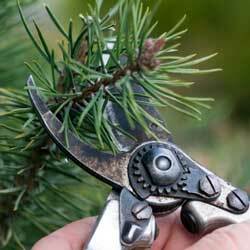 Before you go chopping away, do a little research about when your shrub should be pruned. If you don’t do it at the right time, you won’t get many (or any) of those gorgeous flowers to enjoy. Shrubs that produce flowers on wood grown in the same season should be pruned in late winter or very early spring. This allows time for the wood to grow and the current year’s buds to set to produce more beautiful blooms the next year. Shrubs that bloom on year-old wood and need to be pruned just after blooms fade. This allows enough time for the new branches to form next year’s buds. Still Not Getting Any or Many Blooms? Even with proper pruning, it is possible you may not be seeing the blooms you’d hoped for. Some routine maintenance will help keep your plants healthy so they can produce those fantastic flowers. If you haven’t already done so, fertilize plants this spring with Plant-Tone, Holly-Tone or similar products (for those acid-loving azaleas and rhododendron). Move the mulch and sprinkle the food lightly over the soil at the outer edges of the plant, then water well. Replace the layer of mulch to help conserve moisture and prevent most weed growth. Though an established shrub can endure a moderate drought, it will flower more reliably if you help it through the dry weather with a weekly watering. Consider a drip system to provide good water and minimize evaporation. Other reasons your shrub may not be putting on its best flower show might include improper lighting or incorrect soil conditions. Similarly, if a plant does not receive enough sunlight or if the soil pH isn’t suitable for that type of plant, it will not flower as it should. If you’re having trouble with a particular plant, stop by or call us to help you find out why. And, remember, sometimes it just takes patience. Some plants, like wisteria, can take up to seven years to produce flowers, but will be well worth the wait for the amazing show they produce.